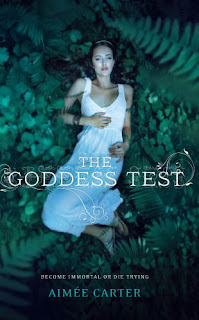 The Goddess Test is the debut book of Aimee Carter and the first book of the Goddess Test series. Kate has made a deal with Hades. She must stay in his mansion for six months and pass seven tests delivered by the Gods. I made the mistake of assuming these Olympians tests would be of epic proportion. Instead, I spent the entire book wondering along with Kate how she is even being tested. The only two tests we are aware she is taking is a pencil and paper test and a test in which Hades gives her the answer. The Goddess Test is told from Kate's point of view, and she spends the entire book waiting. I will not be waiting for book #2. Have you read the Goddess Test? It is getting great reviews. I would love to hear your thoughts. So ... I can't tell - did you like it or did you feel that you spent the entire time waiting and that's a negative thing? I'm currently reading this book (very beginning) and so far I really like it although the pacing of the novel is a bit off. You are right. I do not do well being negative. I thought people could decide for themselves how much they love waiting. (I don't.) I added another line "I will not be waiting for book #2." Now I will feel bad about that line all day, but I do need to be clear. I'm glad to hear you really like it so far! This book has been getting so much hype with being the #1 requested book on NetGalley. I see a lot of people are loving it. I've been reading in several reviews that the depictions of the Olympians is very much inaccurate, as in not in line with their abilities and personalities. I'm still on the fence as to whether or not I want to read the book. I've read about a lot of mythological cycles, especially Greek, and I have the feeling I would spend the entirety of the book in frustration if this is true. Marla, they do not act like ancient Gods. They act like young adults. Thanks for the review, I appreciate your honesty. I haven't read this one yet and am glad to have this information. I wouldn't feel bad about giving your honest opinion, you seem very balanced and fair here. I know how hard it is to write a review, though, when you don't like the book much. I didn't like this one either. Too many things that I tested my plausibility meter.